Since the 17th century in England, a pocket watch told so much about a gentleman. Wealthy gentleman with pocket watches on chains, which fitted into perfectly tailored pockets, would demonstrate their social standing with the type of pocket watch they owned. Pocket watches weren’t confined to the rich. Poor people also inherited them and owned them. Though it is more likely the timepiece was made from brass or silver, than the gold or platinum ones of the rich. Thomas Tompion (1639-1713) is often referred to as the father of English clockmaking. Escapement design and around seventy-five per cent of watchmaking innovations came from England. George Graham, a student of Tompion, also made innovations, and his student, Thomas Mudge (1715-1794), invented the lever escapement, which is still used in watchmaking today. John Harrison (1693 – 1776) resolved the problem of how to find longitude at sea. Great watchmaking skills in England followed with John Arnold and Thomas Earnshaw. There are many more past innovators and fine English watchmakers. The reign of English pocket watches subsided in the second half of the 19th century, when the Swiss and the Americans adopted mass production techniques. Then the watchmaking industry in Britain collapsed. Nevertheless, England produced many fine specimens. 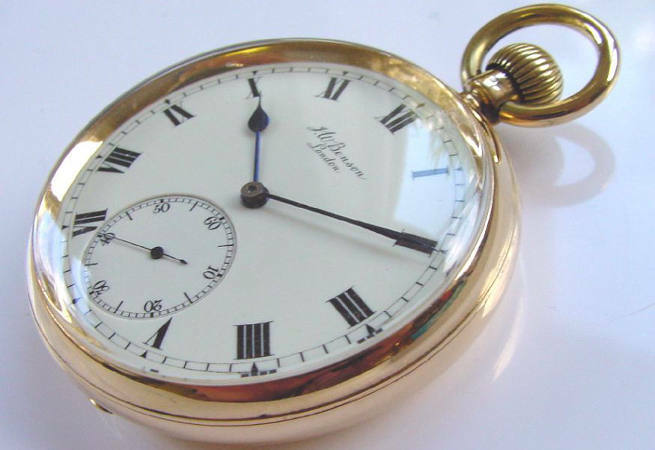 A fine and rare Tompion pocket watch could fetch anything up to £60,000. Collectible English pocket watches are still amongst the finest in the world, and our Master Watchmaker is dedicated to their specialist repair. We are one of the few jewellers in the UK to have our very own Master Watchmaker. We love nothing better than to see a fine English pocket watch brought back to its original form, which is why we are dedicated to their repair and restoration. Whether you are a collector or have inherited a beautiful heirloom, we can help preserve your English pocket watch so that it holds its value. Our Master Watchmaker is an expert in the repair and refurbishment of antique and vintage English pocket watches. You can feel rest assured that your fine and rare pocket watch is safe in our hands. From dial restoration and case refurbishment, to complicated mechanical repairs, our Master Watchmaker understands the delicate nature and the complex workings of English pocket watches from early, rarer escapements through to more modern movements, and can repair and restore your pocket watch, no matter what state it is in. Offering unparalleled expertise, our Master Watchmaker can turn his delicate hand to the restoration of the most highly decorated cases. His knowledge of a vast range of the inner movement types of pocket watches also ensures every single repair is carried out with the expertise, sensitivity and care required to maintain the integrity of the timepiece. Our Master Watchmaker is a very capable restorer of all forms of English pocket watch, and we are delighted that he has succeeded in many cases where other watchmakers have failed. You can expect an exceptional service with W.E Clark. We were recently voted regional Independent Retailer of the Year 2017, and we also won Best Independent Fine Jeweller in the UK at the Professional Jeweller Awards 2017. We will take care of your English pocket watch from start to finish. Our Master Watchmaker will carry out repairs and restoration work with the utmost sensitivity and expertise. We are absolutely confident you will be delighted with the results, but for peace of mind we offer a minimum 12 month guarantee for all work undertaken. You can ship your timepiece to us from anywhere in the UK using our Royal Mail Special Delivery FREEPOST service. Your English pocket watch is insured for up to £20,000 throughout its postal journey, from the moment the package leaves your hand to when it is posted back to you. Before we commence any work, we always discuss any repairs and costs with you first. Pocket watch repair with W.E. Clark couldn’t be easier. We would love to repair any English pocket watch from any destination. Outside of the UK you will have to organise shipping, other than that you can expect the same exceptional pocket watch repair service. Feel free to bring your English pocket watch into our Lewes showroom. We would love to meet you and discuss your English pocket watch repair requirements with you.